Let’s face it. Pumpkins are a staple of autumn. The classic pumpkin orange matches the colors of many leaves falling to the ground. They are the companions of black cats and trick-or-treaters at Halloween. They make great pies and desserts enjoyed at the holiday table. 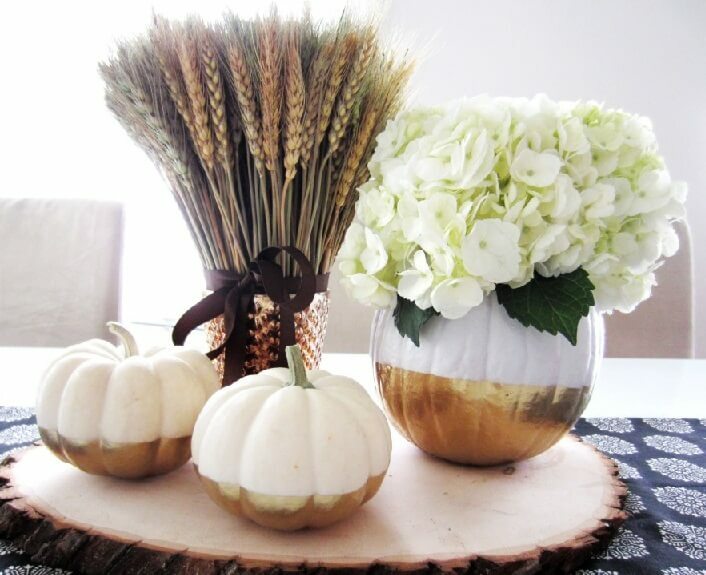 So, what is more appropriate for the Autumn table than pumpkin centerpiece ideas. Pumpkins are extremely versatile. Left whole, they can sit at many angles to give everyone at the table a beautiful view. Cut open, they make great flower holders or a classic Halloween light. While most popular in orange, white and speckled pumpkins offer new options for color schemes. Of course, if you can’t find a pumpkin in a color you like, you can always paint it. Or top it with glitter. You will see all of this plus more with these pumpkin centerpiece ideas. These pretty little gourds work well with other items, to make your centerpiece or tablescape unique. Add some cranberry vines, pine boughs, or cones for a color and texture contrast. Vine balls, in all colors, work well against the ribbed pumpkin exterior. Glass, crystal, and silver goblets are just a few options for display. Don;t forget ribbon and bows. 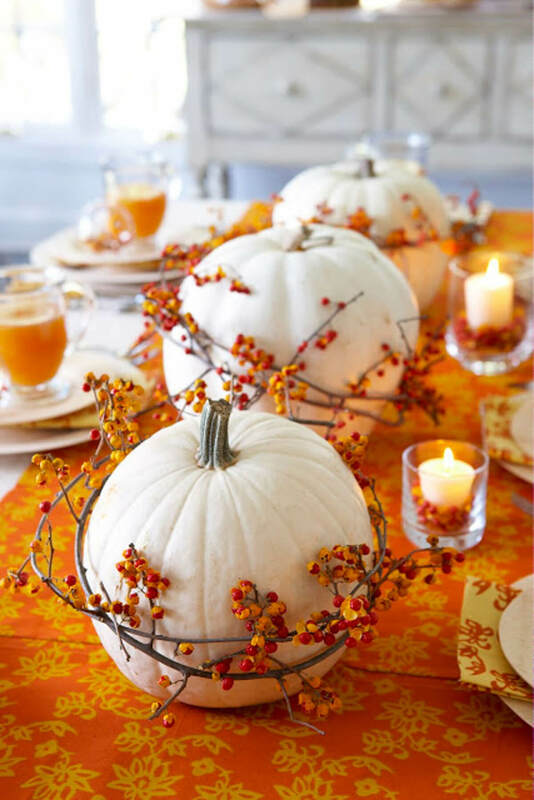 Use these pumpkin centerpiece ideas as your inspiration this Autumn. 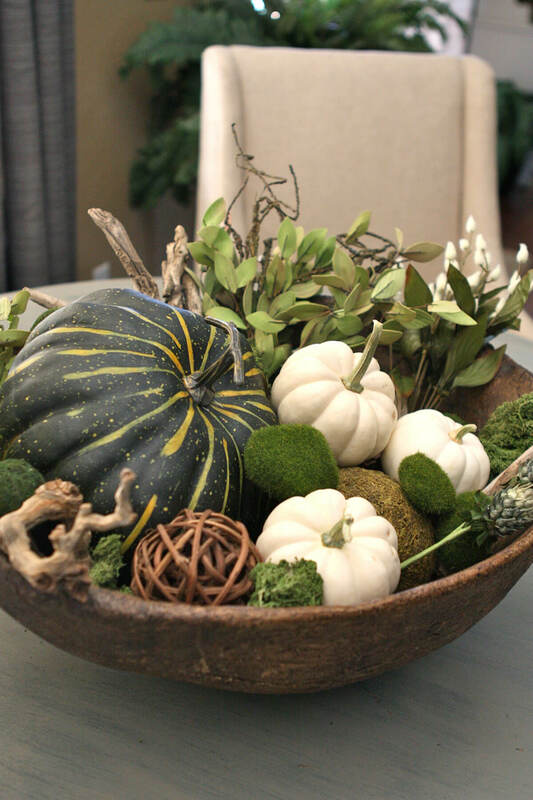 This elegant centerpiece celebrates fall with every component. 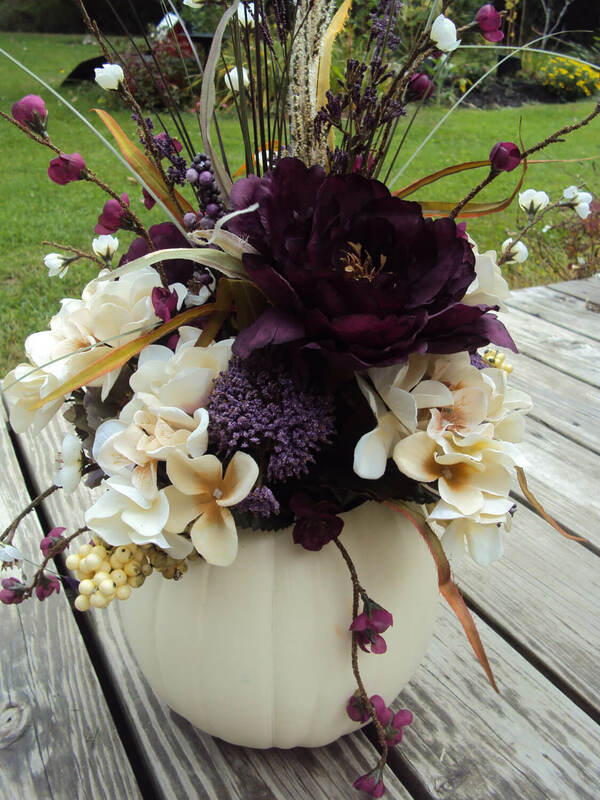 A faux pumpkin serves as a vase, and silk flowers and berry stems are arranged inside. The foam may be used in the bottom of the pumpkin to keep the flowers in place. This classy design can be adapted for everything from fall weddings to the kitchen table. To bring the beauty of nature indoors, try this arrangement. A large, rustic wooden bowl sets the stage for a hodgepodge of fall’s bounty. Try varying the sizes and textures of each item for maximum impact. Color also plays a part, and bringing in several shades of green and brown evokes the forest floor. 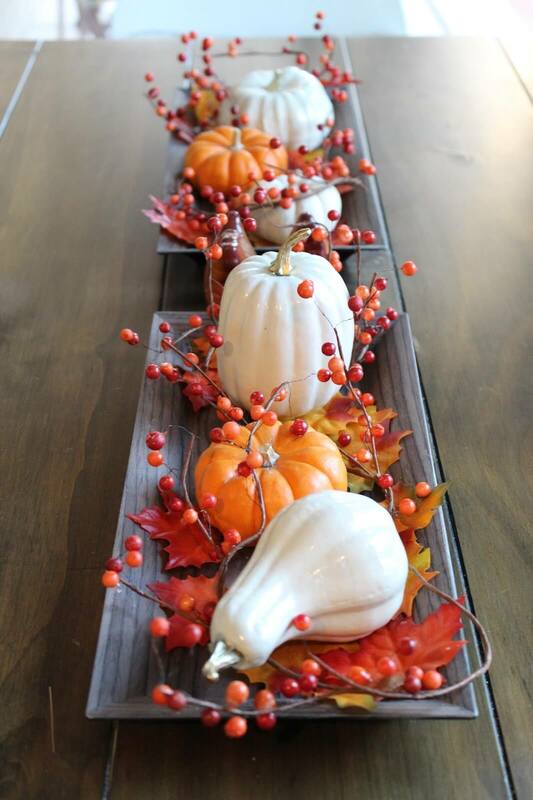 Skip the bowl and vase and use a wooden plank as the holder for pumpkins, squash, and berry stems. An underlay of colorful autumn leaves grounds this arrangement with a touch of texture. This centerpiece would look great on large or long tables. For those who prefer a more glamorous interpretation on an autumn theme, try this centerpiece. It features gold sparkles and glitter, and the pumpkins are transformed from boring to glam like Cinderella at the ball. 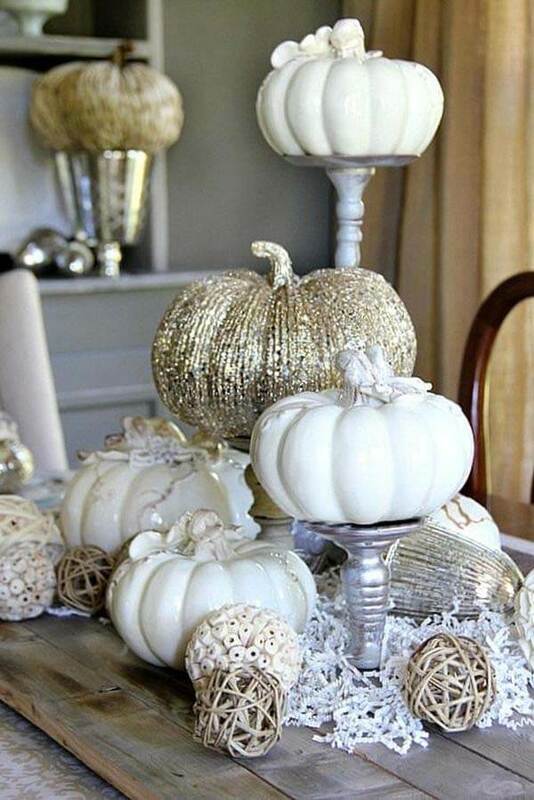 Using white pumpkins with gold accents keeps things tasteful, and alternating the gold design on one or two pumpkins adds interest. Switch up expectations by using white pumpkins and orange everything else. This centerpiece makes white pumpkins the star by contrasting them with orange and red berry stems, orange table settings, and a gloriously orange tablecloth. Wrapping the pumpkins in the berry stems offers some contrast in texture and size, and really offsets the color difference. 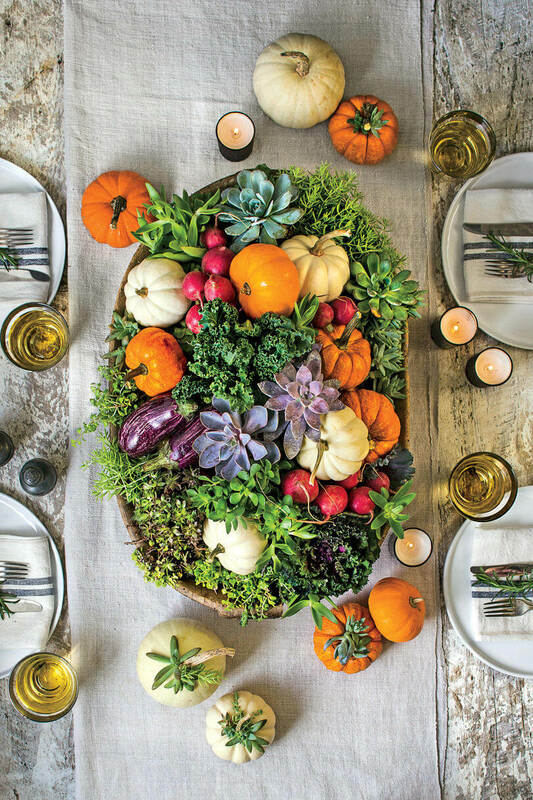 Bring some Southwestern flavor to a fall centerpiece by using beautiful green succulents. 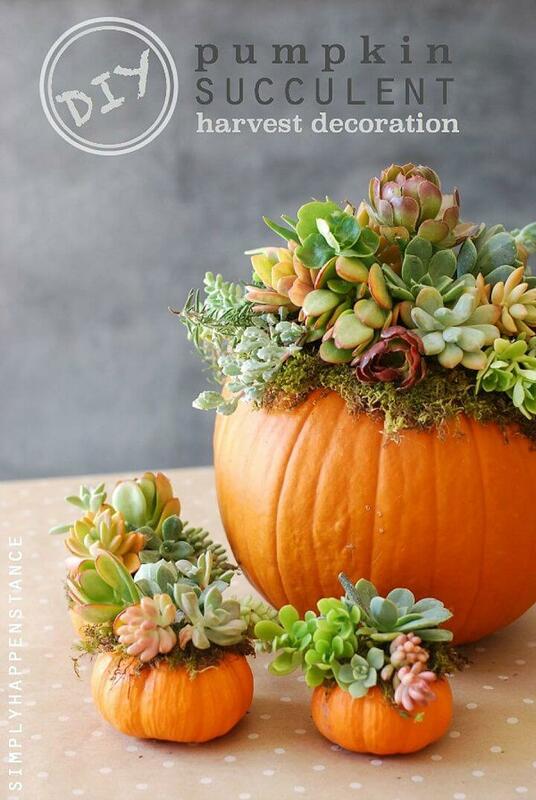 Using a faux pumpkin base, arrange a variety of succulents at the top. Because of their ground-hugging nature, succulents lend this design a compact look. The shades of green contrast nicely with the bright orange of the pumpkin. 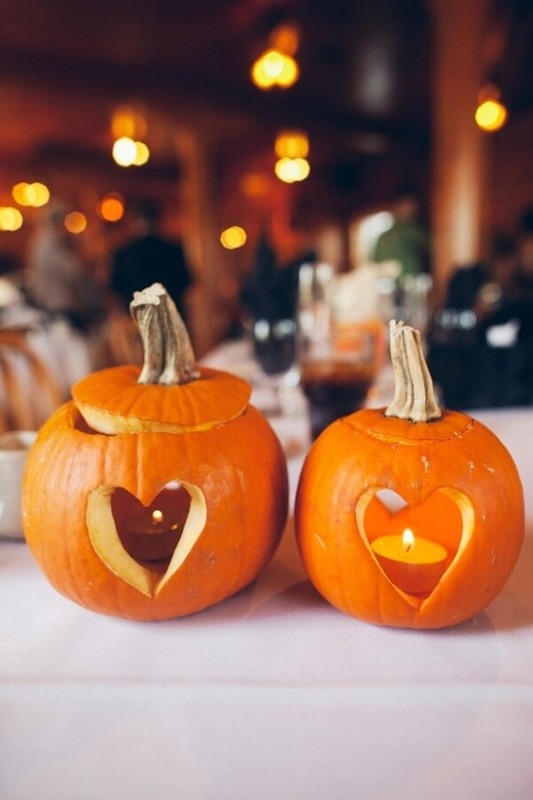 For a special autumn dinner, bring in some understated romance with these pumpkins. 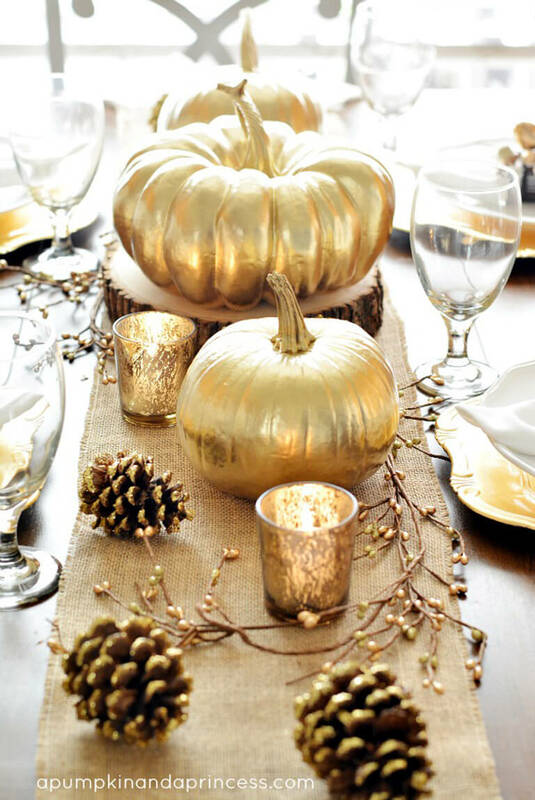 Spray-paint pumpkins and pine cones in gold, and add small votive candle holders that feature golden flecks. Gold berry sprigs add some texture and interest and bring in a softer element. A rustic burlap runner gives it dimension. This cozy look has serious homespun charm. Find a slightly worn pitcher in your local thrift shop, arrange wheat stems inside, and surround the base with small pumpkins. A simple serving tray brings this centerpiece together. This centerpiece would look fantastic for an everyday kitchen table to evoke a nostalgic feeling of harvest-time. This centerpiece is simple but beautiful. Keep it modern by using a wire basket to hold white pumpkins interspersed with sprigs of greenery. Because of its simplicity, this design would look right at home in a den or living room, as it would not distract from other decors. It’s also would be appropriate for anyone who prefers minimalist styles and wants very little fuss. Perfect for an upscale dining experience, this centerpiece uses elegant white and silver pumpkins to create a fairytale atmosphere. The monochromatic color can be offset by sparkly beaded textures, and woven hemp balls add a subtle contrast to the otherwise glitzy appearance. Silver candlesticks and cake stands can be used to stagger the height of these beautiful elements. Small but vibrant, this floral arrangement capitalizes on the colors of fall flowers. Using a white ceramic pumpkin-shaped vase, signals the season, while small autumn sprigs are tightly packed near the top. Though it differs from the usual fall palette of warm colors, the shades of deep purple, green, and fuchsia work together for a subtle autumn look. Here is a unique and easy way to showcase your autumn spirit. 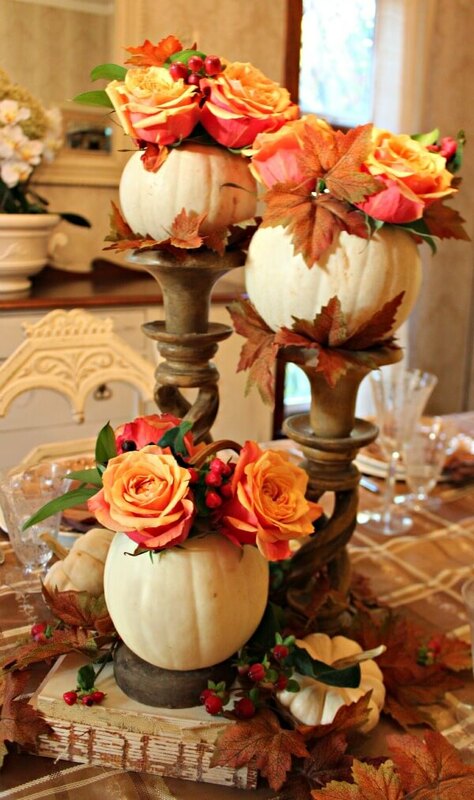 Drop small pumpkins into tall cylindrical vases to create a stacked look. You can try keeping like colors together for a bold look or alternating them for a more harmonious feeling. The heights of the vases may differ according to preference, but the variety in height and color make this centerpiece a modern stunner. Use weathered or rustic candle stands to add height and dimension to your centerpiece. Notice how the candle stands take a traditional pumpkin and flower decoration and turn it into something more decadent. To tie the elements together, try using loose leaves as bases for the pumpkin arrangements when setting on the candle stands. Just because you prefer a more neutral, understated style does not mean you have to forgo a fall centerpiece. 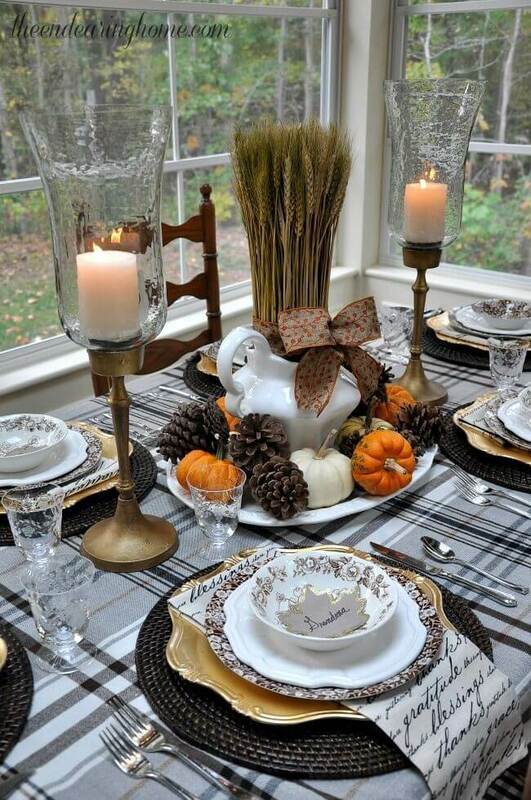 This look features painted white and grey pumpkins of varying sizes, set against fresh foliage and dried pine cones. The color scheme is on the neutral side but is far from subdued. 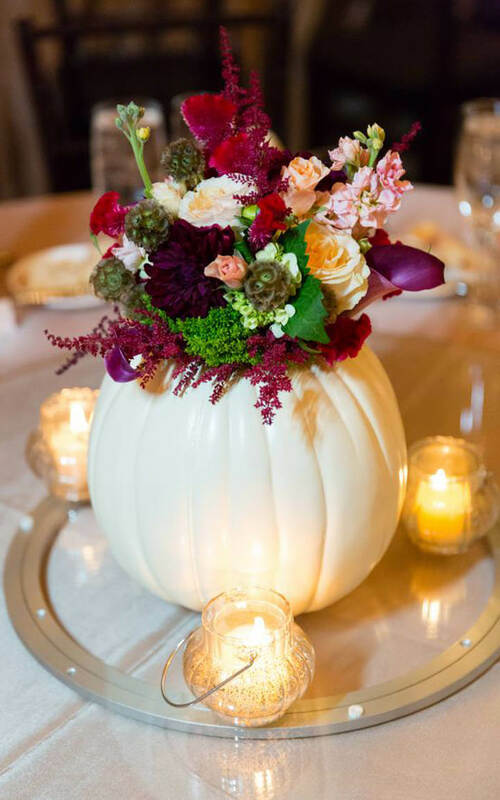 The diverse textures used among the pumpkins helps this centerpiece shine. 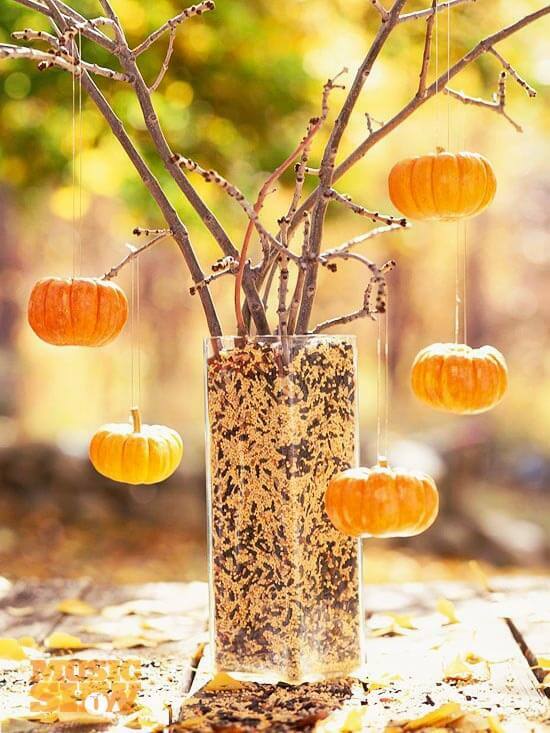 Great for an outdoor fall decoration, attach strings to small pumpkins and hang them from a small tree form that is anchored by a beaker full of birdseed. Not only will the birds love it, but it is a simple way to herald the season on a deck or porch. This centerpiece can easily be brought inside, too, and still look stunning in a kitchen or dining room table. Think vertical for this arrangement. Using the classic white pumpkin as the vase, this centerpiece incorporates some of autumn’s loudest and colorful flowers, such as sunflowers and chrysanthemums. Accent the flowers with a burlap bow, and add more height by introducing wispy greenery and tall berry stems. The color scheme remains traditional fall but still pops. 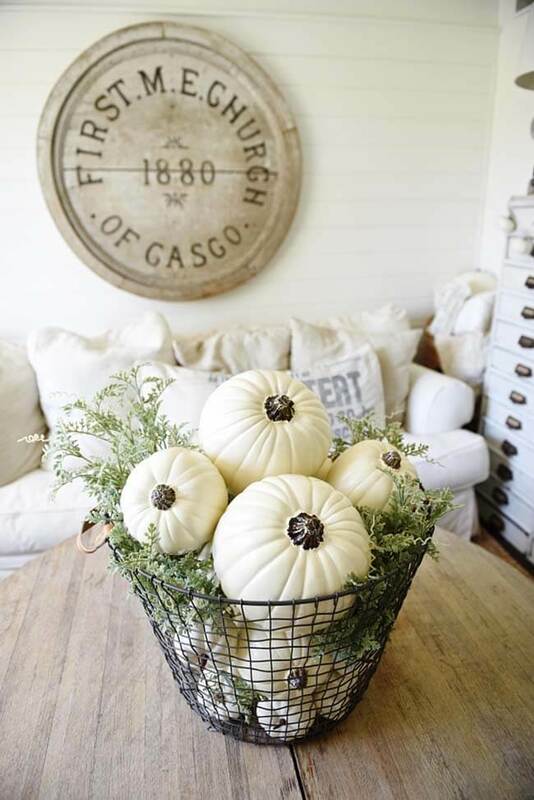 Meld fall with winter by using these painted, glossy white pumpkins. Add some Christmas flair by adding a green satin ribbon around the middle of the pumpkin, and make it shine with a glittery pin. 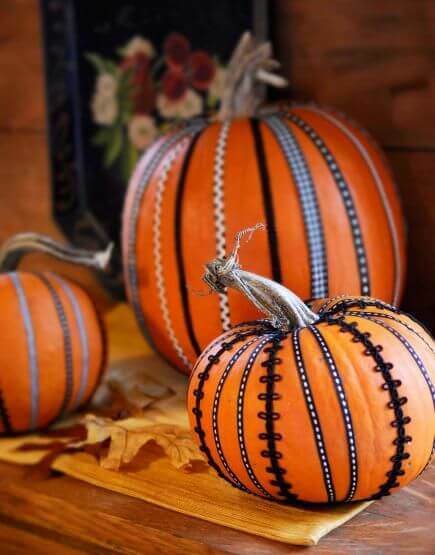 The sizes of the pumpkins and ornament pins can be alternated to add some extra interest. Line up these pumpkins for understated elegance, or cluster them together. Celebrate autumn’s bounty with this large and impressive centerpiece. Perfect for a rustic dining room table or long sideboard, this design is classic. Cream pillar candles are surrounded by forest greenery, berry stems, pine cones, leaves, and all kinds of pumpkins and squash. Play with dimension by using larger elements toward the middle of the table, scaling down toward the ends. Fall does not have to mean a warm palette, and this arrangement is proof. Maximize the power of purple by contrasting deep plum flowers with creamy, white blooms. The texture of thistles and berries offer an extra dimension, and delicate white petals add refinement. Though it could be used in any home, this centerpiece could also work well for fall wedding decor. This striking centerpiece is all about structure. 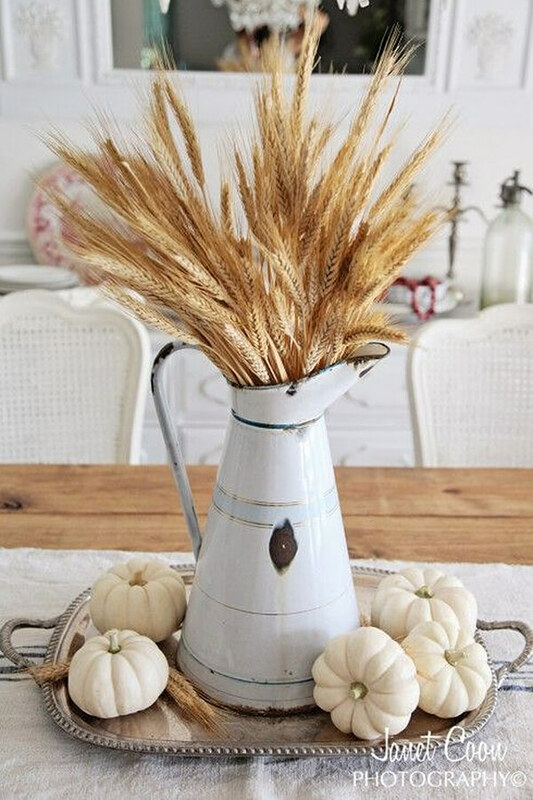 Tall, straight wheat stems stand proudly in a white porcelain pitcher, and at the pitcher’s base are orange and white pumpkins. These are contrasted with dark brown pine cones. A festive bow keeps the wheat stems in place. Because of the distinctive color combinations, this look would be well-suited to late fall, even Halloween! Turn the idea of a jack-o-lantern on its head by getting creative with the cut-out designs. 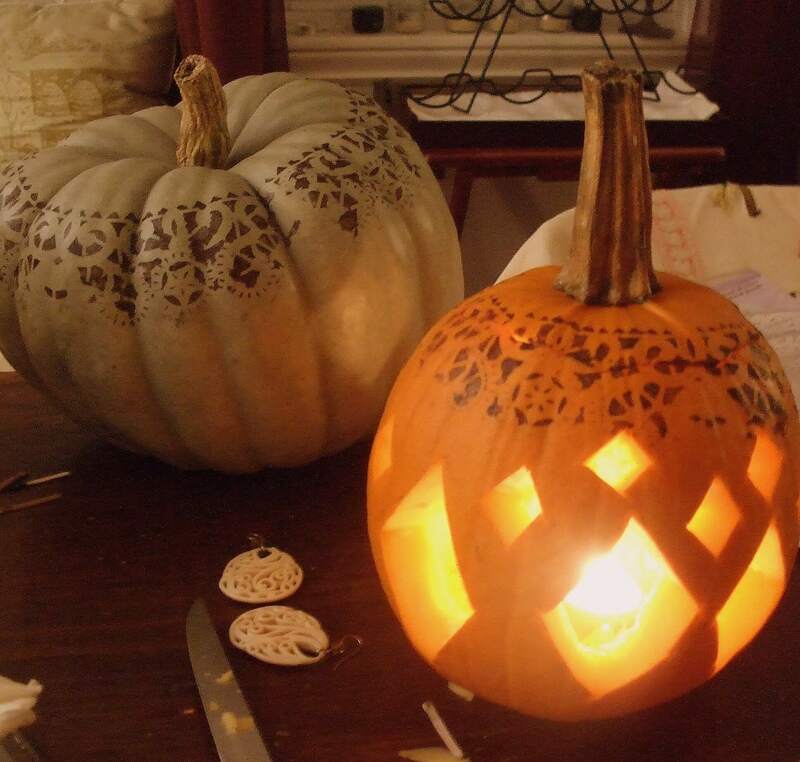 Carve diamond shapes into a pumpkin, and be sure to draw graphic designs near the top. Light up the inside and this centerpiece can light up a table or countertop. You can also skip the knife and simply draw delicate designs around the top of the pumpkin for extra flair. Unexpected and charming, gluing ribbons on pumpkins is a unique way to decorate pumpkin centerpieces. Try using ribbons with contrasting colors and designs to really make this look pop. Different patterns can be alternated, as well, and be careful to hide or trim any loose ends. 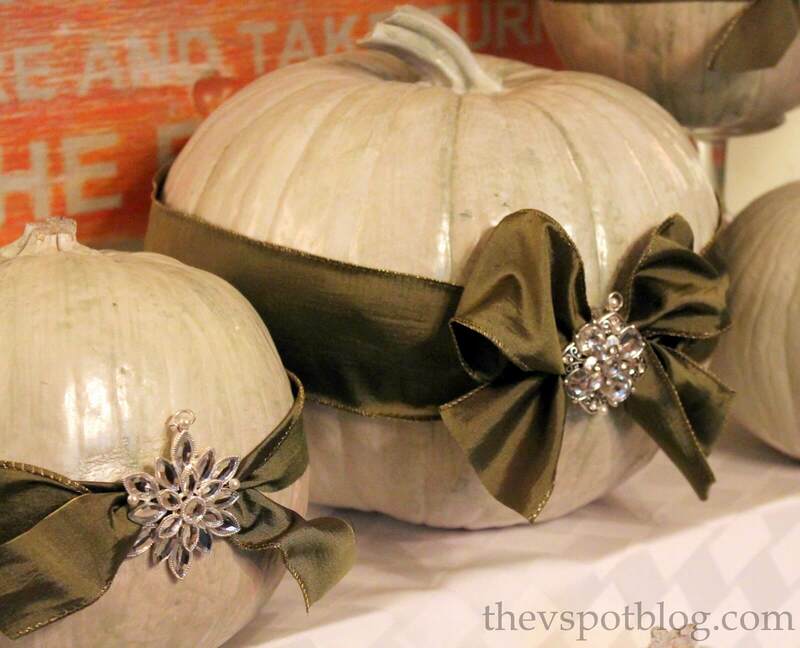 This decoration keeps the beauty of the pumpkin while adding a simple extra to take it to the next level. Bring a subtly aquatic touch to your centerpiece by using floating candles. 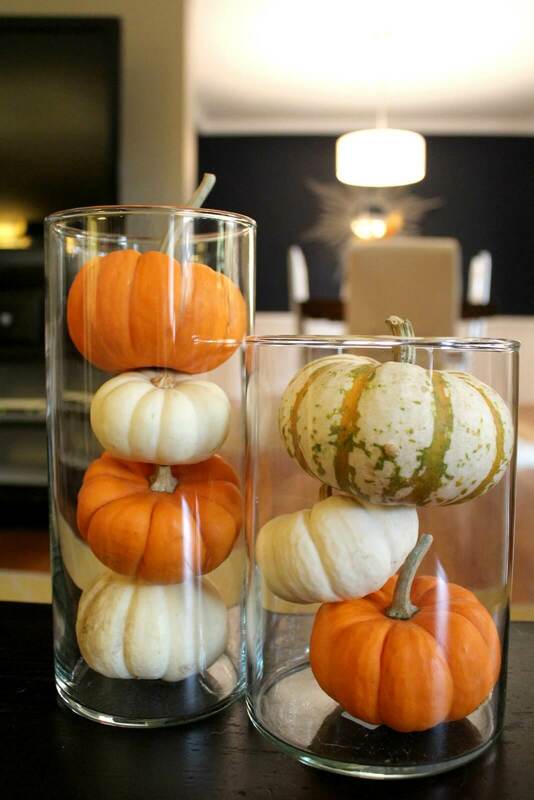 Stack small pumpkins inside a tall, square glass vase, and pour water over them. Set the floating candles on top and light. 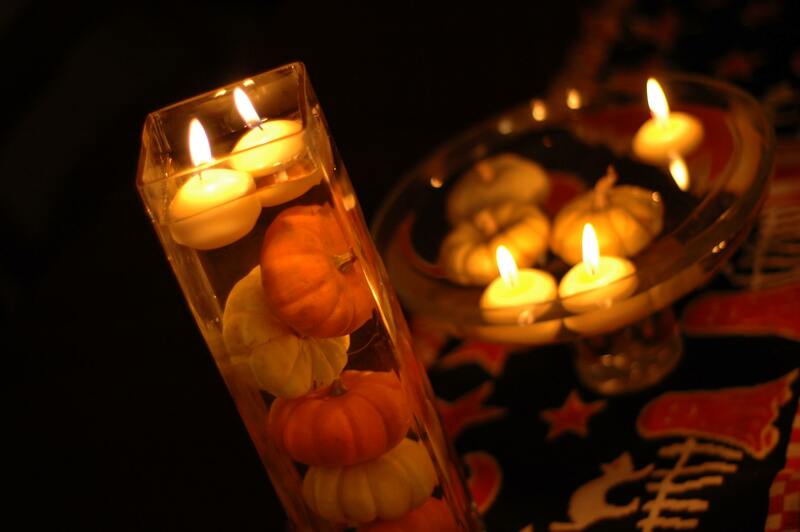 The color of the pumpkins and simple beauty of the candles will add to the effect. You can also add a smaller or shallower dish with similar components to add some variety. 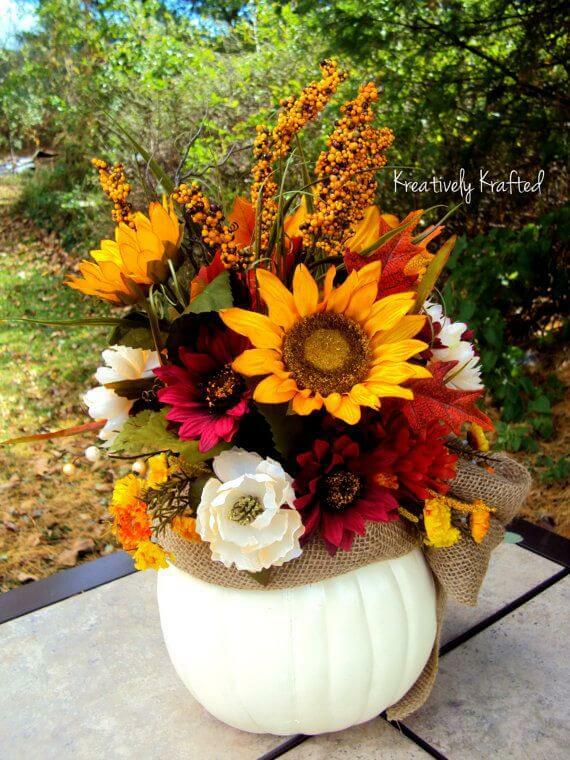 Make the most of an orange pumpkin by making it the base for a beautiful flower arrangement. The key to this arrangement is keeping all elements small and proportional. Small pink and red flowers are arranged inside the pumpkin. Because this centerpiece is so pleasingly compact, it can be replicated in any size you wish. This sepia-toned centerpiece is the height of elegance. 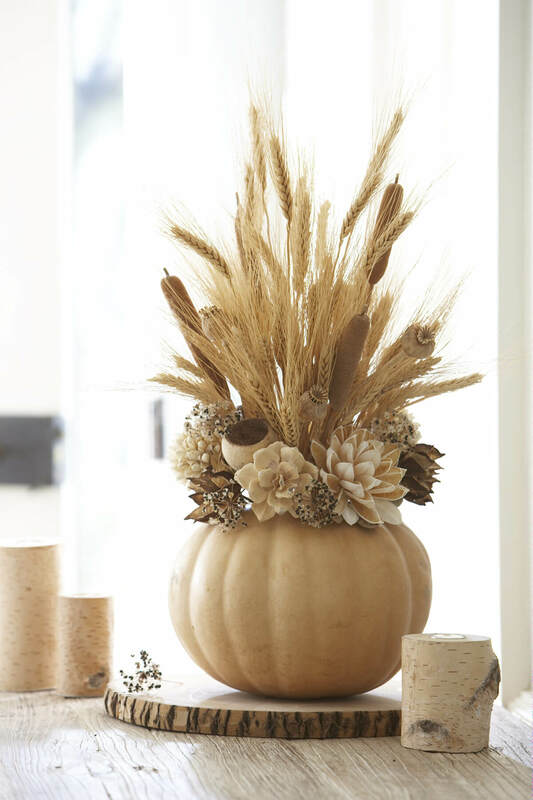 Using a white pumpkin, let wheat stems stretch free, and surround them with catty nine tails and small brown flowers. Though it uses autumn elements, this arrangement evokes a beach or lakeside feeling, and it would be well suited to homes that use water as a decor inspiration. Its limited color variation also makes it a classy choice for any home that would coordinate with anything. Plentiful in color and texture, this centerpiece would be great for any dinner table. Using succulents, pumpkins, and ruffled greenery, this arrangement is accented by smaller pumpkins that are placed informally around it. Instead of flowers, beautiful root vegetables such as radishes and cabbage provide color and celebrate the foods of the season. These two-tone pumpkins provide an unexpected visual twist. Gold on the bottom and white on the top, they show off their personality. The pumpkins can also be left intact to make a statement alone, or the stems can be cut off and they can be used as a vase for seasonal flowers. Placed together, they are quite eye-catching. Finally, this beautiful design will make everyone feel at home. Take a small pumpkin and carve a heart out of it. Place a tea light candle inside, and this simple accent will happily sit on a table or countertop. It is a fresh take on the typical or scary Halloween design, and will warm the heart of every person who sees it.